You will notice that the chuck of your mini-lathe is attached to the spindle with three bolts. We are aiming to remove the chuck and attach the worm wheel blank directly to the spindle. 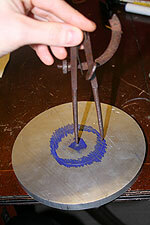 To do this, we need to make three M5 tapped holes in the worm wheel blank that line up with the holes in the spindle. To do this, we take our dividers and set them to 1.3 inches. This is the radius of the bolt hole circle on the mini-lathe spindle. Do a couple of tests to make sure your dividers are scribing a circle of exactly 2.6 inches diameter - although it is tricky to do this better than about 0.005 inches. 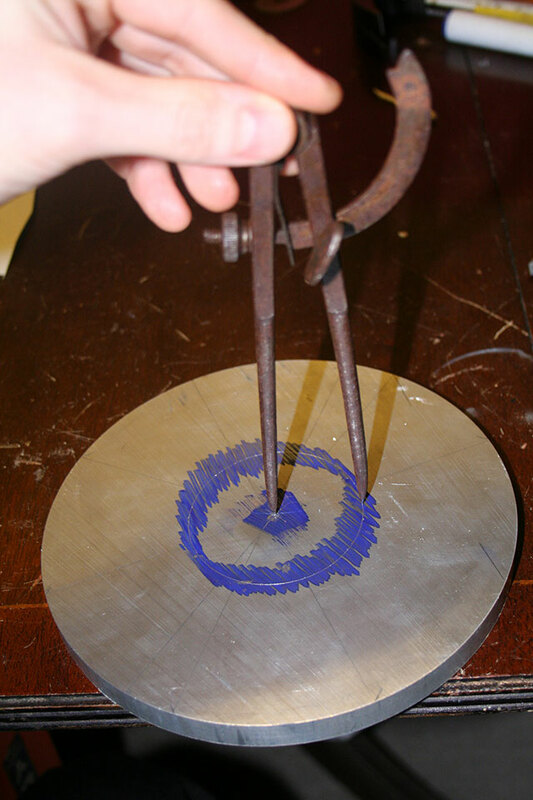 With one end of the dividers in the prick punched hole in the centre of the worm wheel, scribe a circle of 2.6 inches diameter on the worm wheel blank. If you've never done this sort of thing before with dividers, then practice a few times. 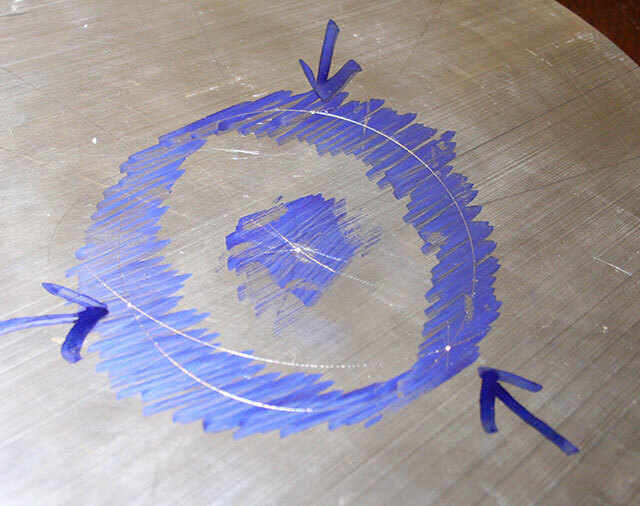 Once we have a nice circle, we need to make a prick punch mark somewhere on the diameter - does not matter where on the diameter, but it needs to be bang on the line. Reset the dividers to 2.25 inches. Put one end of the dividers in the new prick punch mark, and scribe an arc that crosses the diameter twice. The distance between these two crossing should also be 2.25 inches - just because of geometry. If this appears not to be the case, you've got something wrong, so start again. If it all looks ok, make two more prick punch marks where the arcs cross the diameter, and you will end up with a centre prick punch mark, and three punch marks on the diameter, which are equally spaced - these are the bolt hole positions. Finally, enlarge the prick punch holes with a center punch, make another cup of tea, and go and find your center drills.